Because sleep late the next night, I woke up late in the morning, at 07:00 am. And after a shower and breakfast recently completed 0830. Loic already waiting on the porch hostel from 08.00, before the doors opened hostel. Said Richard, this is great progress because in Singapore two years ago, she could not get up in the morning. I feel guilty already up late, and just ready to leave at 08.30. Over breakfast I became acquainted with the Diga, formerly Richard’s office friend who now lives in Malang. We then headed Lebuh Chulia to wait for Rapid Penang bus 204 destination Penang Hill. The previous night I had a check on the Internet, via a bus Lebuh Chulia. While waiting we had to buy local fruit slices in one roadside seller. But after waiting until nearly 1 hour, there is no 204 bus passing by, I was wrong. One of the residents there corrects that Rapid Penang bus 204 does not pass here, but through Lebuh Light, we are shown the direction to the bus stop at Lebuh Light. There is one female British tourists who also want to Penang Hill, eventually we jointly go there. However, due to lack of clarity about the direction of the people, we could not find bus stop locations in question. And started walking in the opposite direction to that shown. Finally we walked towards KOMTAR (Kompleks Tun Abdul Razak), because there is a central bus terminal in addition to Jetty. Towards stop in Jalan Penang, we saw a 204 bus behind us. We immediately ran to the bus stop to catch the bus. Fortunately for many who want to Penang Hill, bus stops long enough. So we were all able to ride the bus. In KOMTAR, more passengers who ride the bus so full, luckily we still find an empty seat for a trip to Penang Hill far enough. Nearly an hour later we arrived Stesen Bukit Bendera, at the foot of Penang Hill. The original plan, if we go only four of them are my hiking ride to Penang Hill via Penang Botanical Gardens, met the others at the top of the hill, and down using the funicular train. But since the Loic went to two places that day, and before 5 pm we had to go back to the hostel so I canceled the plan. Because it was already noon, 11:00. The queue of visitors who want to climb to the top of the hill was long. Fortunately for buying a ticket does not need all passengers, simply represented one person. I also queue while others waited in rows of seats offered by the management. Tickets are distinguished by nationality, citizen of Malaysia just pay RM8 pp, while foreign nationals RM30 pp. It took 30 minutes before I got a ticket. Afterwards I immediately tell my friends to go to the train platform. After a short wait, we climbed onto the train. The trip to the top very quickly, about 15 minutes. Trains running on slopes up to 45 degrees. This rail line was first built by the British Government in Malaysia in 1923, and trains are used has undergone several replacement. Train we ride the last series that was first used in 2010. We were soon driving around in Penang Hill. We had tried binoculars coin there to see objects in Georgetown. In this place there are Sri Aruroli Thirumurugan Temple, Penang Butterfly Farm, Penang Hill Mosque, children’s playground, etc. Visitors can also rent a car buggy to get around Penang Hill. The fare for the 45 minute RM60 and RM30 for a 30 minutes. Diga and Irma had made a hand painting here. While we wait for them, Loic was approached by two local teenagers who mewancarainya concerning how to travel in Penang. I had thought he was in-scam, but thankfully it was not. Maybe they are high school students who need the material to write the school corridors. Being around Penang Hill, we decided to go down and get to the next destination, Kek Lok Si Temple. Second place is actually not much, but still have to use the bus because that road far enough. We had difficulty with the entrance to the temple, but it turned out to get in and out using the same road, which is on the left side food court, past a bridge over a small river and got into a lot of people selling souvenirs. Kek Lok Si Temple, located at the top of the hill. The journey up to the top quite exhausting, takes about 20 minutes. Coupled with the hot weather which made our Penang dehydration. On the way we buy bottled drinks. Not long after we arrived at the entrance to the temple. Along the road leading to the temple, we found some beggars who wished mercy of visitors. Immune to these beggars tactics in Indonesia, I do not give money to them. We spent some time to take pictures at this place for a further rise towards the courtyard of a statue of the Goddess Kwan Im (Guanyin), the highest in the world. Why Buddhist temples have a goddess? The statue is the personification of Buddha itself tangible female, in the culture of East Asia community. To arrive at the top, we go up the funicular elevators, but not as high as in Penang Hill earlier. We have to pay RM2 for round trips. Sales of tickets at a booth at the end of the souvenir shop. After a short wait, the elevator arrived and we jumped. It takes up quite short, less than two minutes. Back out of the store, and seen the giant statue. We spent the time to take pictures here. 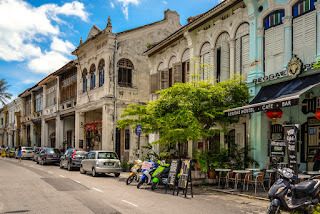 Plans to Penang had been decided long ago, I bought a ticket AirAsia in June of the previous year before I had no passport and no experience abroad. Reassured friend and he wants to buy advance tickets, I melted. Initially my mind, because in September and October of 2012 I’ve been to Malaysia, but never mind, it may be true greeting my friend, there is no similar cities in the country. As a result, Penang is the third picnic spot me in March, after Bandung and Makassar – Toraja. This month the toughest, especially for the financial condition of having to pay for three trips. I do not recommend unless indeed free labor. On the 28th I permit rapid return of the office, at 3. But there is a stupid problem I experienced. Here’s the story, in the office there is an ATM machine, BCA and Mandiri. My main account is Mandiri, where I placed honorarium. But has long Mandiri ATM is damaged. Then I went to the BCA ATM to withdraw money. Because pin BCA and Mandiri I like, 6 and 4 digits, I insert my BCA ATM pin. I forgot that I enter the debit card is Mandiri, BCA instead. I tried it 4 times but always failed. An error message that I do not understand. I leave, thinking maybe a problem in connectivity between BCA and Mandiri. I then thought to take the money in the ATM Mandiri. 3 pm I went to Soekarno-Hatta International Airport in order not affected by congestion due to the long holidays. Incidentally boss I plan to include annual tax return to the tax drop box in Tangerang City, I plan to take the money in the ATM Mandiri was there. We use the same taxi. The problem arose after I lowered him and went to the ATM. On the ATM menu like the back trying to withdraw money, but I was surprised because it re-emerged notification transaction can not be done and the order to contact Mandiri Call on the back of debit cards. Independent of the officers that I contact the Call me know that I entered the wrong pin 3 times this afternoon. And I remembered I insert pin for withdrawals via BCA Mandiri. Time was running at 16.00, while my plane departed at 17:45 am. Banks are already close if I want to take care of the pin, plus I do not carry a passbook to the office. I immediately contacted my boss had to transfer money to the account of BCA I, and later I returned via Mandiri account. My boss agreed. However, due to Mandiri Internet token of my stay in the office, I had to return to the office. So, I again drove him back to the office. In the office, the problem promptly completed. After I took a token Mandiri. My boss immediately transfer the money, then the money I took in ATM BCA office, and immediately ran back to the taxi. The clock struck 16:10. The problem became so because the door-M1, the line of vehicles coming into the airport is already long. Until 17:05 hours, I have not arrived at Terminal 3, where AirAsia placed. Fortunately most of the vehicles moving to Terminal 1 and 2, so it’s easier for me. Finally I arrived at Terminal 3 at 17:15, and after paying the taxi, with a relatively large tips, I immediately ran to immigration. My experience in the flights before, the tactic is to finalize immigration because more will be snaking queue afternoon. Luckily I managed to overtake some 10 meters before the immigration line, it is enough to save up to several minutes. Done immigration, there are still checking the document line by AirAsia staff. Previously I have never seen a line here, in my heart I am grateful to have passed through immigration. After paying the airport tax and customs checks my last entered the international departure lounge. There I met Irma, a friend of my trip to Penang. This is the first time we met, having previously introduced via Twitter by my friend, Richard. Having met and I told my ignorance afternoon, the call to enter the plane we immediately announced. We then lined up for inspection boarding pass and then queue up the bus that would take us to where the plane was parked. Boarding process went smoothly and after the cabin crew demonstrates how to use safety equipment, the aircraft is ready to depart. However, because of the tight schedule of arriving and departing aircraft at Soekarno-Hatta International Airport that afternoon, the best we had to queue for up to 30 minutes. After takeoff, the flight to Penang International Airport went smoothly, and we arrived at 21.00 pm local time. Disembarkation went smoothly and we leave for the next flight to immigration. But before that, I redeem amount to one of the banks there. The immigration process was no problem; my impression kastam officers in Penang look friendly when compared to Johor Bahru or LCCT example. Done immigration we got out and immediately seek a Rapid Penang bus stop. This is the main mode of transportation on the island of Penang, in addition to taxis and private vehicles, of course. We waited Bus 401E purpose Jetty, Georgetown. 15 minutes we were waiting, the bus arrives. We then go up via the front door and pay the driver. Similar in Indonesia, but the difference is paid out before the ride and the driver does not give change. So try to pay with exact change. The cost is RM2.80 for a distance&gt; 16 km. Because we do not have exact change, so I pay RM6 for two people. 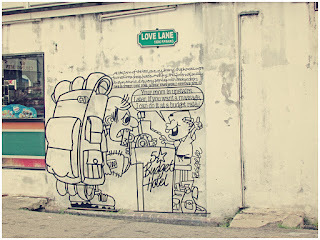 The trip to our hostel at Jalan Love Lane for took 1 hour 30 minutes. This is because the location of the airport in Bayan Lepas in the southern part of the island while our destination located in the north of the island. Irma had asked me if I knew where we were down, so I said no. My guide was that we had to get off at Lebuh Carnarvon, then the road to find the 7-Eleven and not far from there hostels can be found. Only problem is I do not know where the next Lebuh Carnarvon where. When most of the passengers fell in a shopping mall (I later found out that KOMTAR), I was confident to not go down, because not locate Lebuh Carnarvon. Buses run again, and soon I found the name of Lebuh Carnarvon. Duh, unfortunately there is no shelter nearby, so I pressed the button to ask us down. Function keys are asking the driver to stop, at the bus stop or not stop place that allow buses to drop off passengers. The driver was still indifferent and continues on the road. After turning in Lebuh Beach, bus stops, and we were right down through the middle door. That’s on my mind is that we must return to the road earlier. And we get in the alley near where we were dropped. Although less certain, there is no choice because there is no one who can we ask, it was past 22:30 pm. Finally recklessness was not in vain, after a few minutes of walking we arrived at Lebuh Carnarvon, and immediately down the street to find Lebuh Chulia. There we find a seller of snacks like Cimol. Irma wants to buy, but once we all hostels. Across the seller as Cimol I see 7-Eleven at the entrance of Jalan Love Lane, and we immediately headed there. 25 meters later we find our hostel for the night that the Red Inn. On the terrace, Richard was already waiting. He then introduced his friend from France, Loic. While eating we discussed plans for tomorrow. Loic going to Laos day after tomorrow, and in Penang stayed two places unvisited, namely Penang Hill and Kek Lok Si temple. We agree with this plan and plan tomorrow morning at 08.00 to begin the trip. Finished eating, we went back to the hostel. 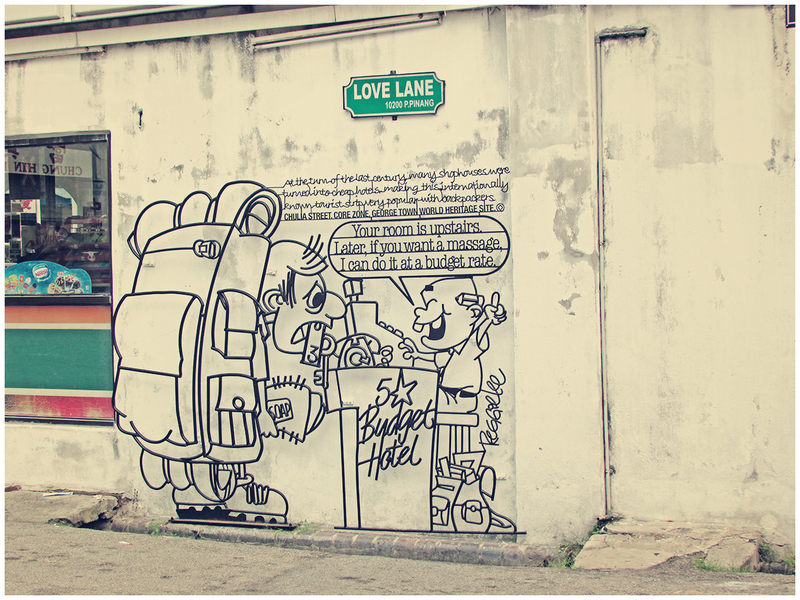 On the way home, we found the first mural that is typical Penang rickshaw pullers in the wall of a building. We then took the photo before going home. Afterwards we rested for tomorrow’s trip.